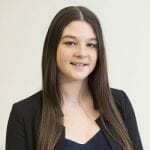 The Tower Center interviewed HCM Tower Scholar Isabelle Gwozdz about her senior year practicum as an intern with the Embrey Human Rights Program and her involvement in establishing the SMU Chapter of the Student Alliance Against Human Trafficking. Gwozdz is majoring in political science with minors in history, French and English, and will graduate in May. Tell us about your experience with the Embrey Human Rights Program. It’s been pretty awesome. I’m not a human rights major or minor, but it’s something I’ve been interested in and so I thought it would be cool to have that experience for my practicum placement. I’ve been focusing on human trafficking because the Human Rights Symposium in September featured people from the Dallas area who had been trafficked. Because that was my first big event with the Program, I continued to focus on that issue for my practicum. What are some of your responsibilities? My efforts are focused on how to connect with the student body. Usually the only involvement the Human Rights Program sees is from students majoring or minoring in human rights, so it’s been hard for them to break into different groups. We also founded the SMU Chapter of the McCain Institute’s initiative to end domestic human trafficking. They have chapters on college campuses nationwide. It’s been really exciting and also a lot of work to get off the ground. What about that first event drew you into the issue of human trafficking? I attended the survivors panel. They had four local women come speak about their experience with human trafficking and it was really interesting to hear them. One of the women, which is what really hit the issue home from me, was trafficked to college campuses. She was trafficked for fraternities, which is so terrible. That’s when I realized that this happens on campuses so it needs to be my focus: How to get the campus involved in anti-human trafficking. That was the “aha moment” for me. What do you hope to accomplish with the SMU Student Alliance? The goal is to create a lasting presence on campus. This semester we are trying to secure our status on campus and expand our membership. Next semester we are going to start having events. We will have a Human Trafficking Week and we’re going to invite survivors to come back and talk specifically to the student body. We want to do an action like visit a women’s shelter or make blankets or something, and we also might screen a documentary. I’m excited because even though my placement is almost over, I’ll get to be a part of that next semester. What was your favorite part of the Tower Scholars Program? 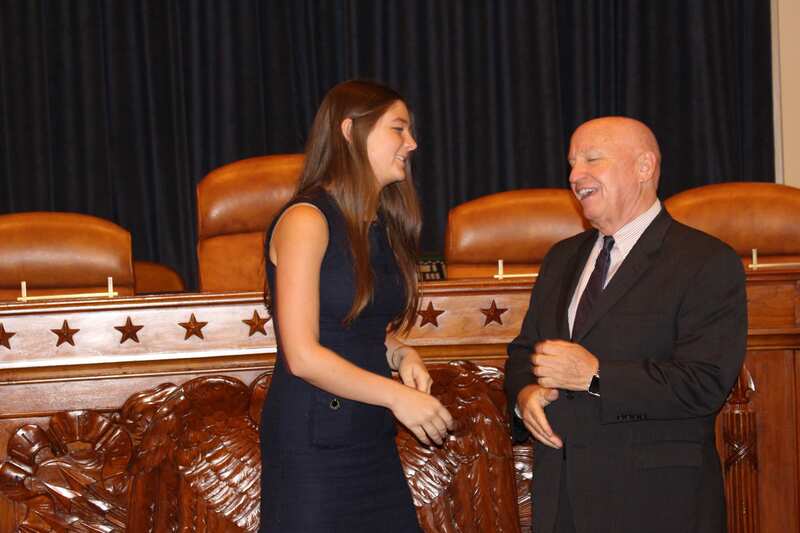 HCM Tower Scholar Isabelle Gwozdz with Texas Rep. Kevin Brady. I really enjoyed our trip to D.C. That’s when I feel like my cohort really bonded. Before I felt like we were class friends, but after that trip and this semester, even without a class, I see them more because we go out of our way to see each other. That trip was an incredible experience — and it was my first exposure to that world. We sat down with Congressmen Pete Sessions and John Ratcliffe, and then I ended up going back and interning on the Hill that summer. It inspired me to apply for internships. We met with so many people and they were on all different sides of the policy. It was so cool to see how many people are involved in the policy-making world and we didn’t just have one perspective, we got to have all of their perspectives, and we were actually there with them. What do you hope to take with you from the program? Already it’s taught me so much. It’s a general life skill to take what you learn in a classroom and actually apply it. The Tower Scholars Program has really taught me how to use everything we learn in the classroom and apply it in real life situations. Even if I don’t go into policy, that set of skills I can use in whatever field I go into.